When Camilla Gray-Nelson came to us for her Dairydell Canine Kennel in Petaluma in 2007, one of the projects along with her logo and website was a company brochure. We designed the brochure as a double-gatefold that feels a little more special when you open “the doors” to the goodies within. The large dog’s head coming from the oak trees on the cover is a grabber for dog owners…especially when they come upon it out in the community. 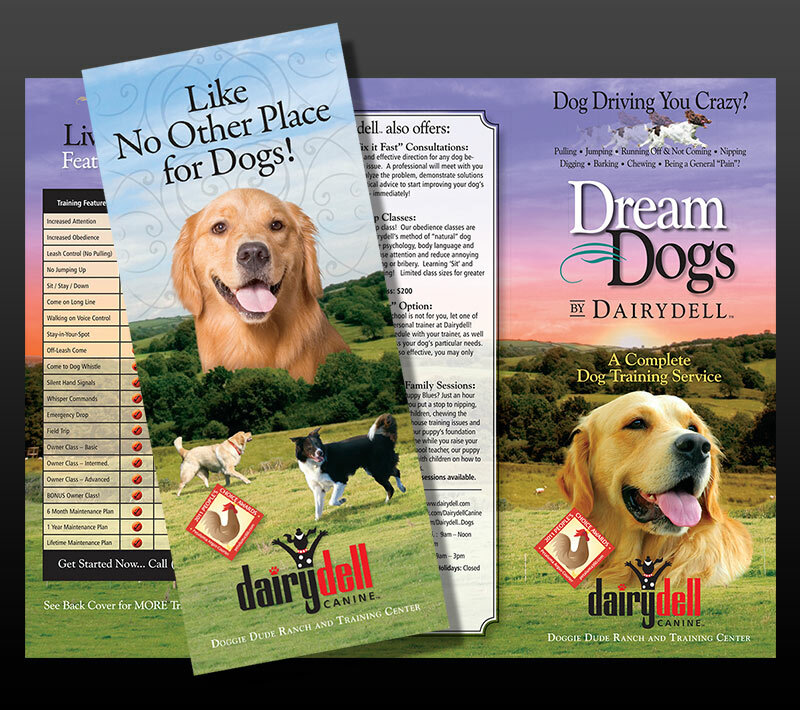 The Dream Dogs Brochure was created a year or so later especially for promoting Dairydell’s Board and Train program. Finally. A really fun place for your dog to stay while you are working or traveling. Dairydell’s Doggie Dude Ranch boarding and daycare facility is on a real farm, with big, fenced fields and real fresh air. Your dog can stay in Bunk House accommodations, enjoying the daily company of other dogs, or in a Private Suite, with at-will access to either a quiet indoor room or generous outdoor run. The suites are perfect for older, or special needs dogs.